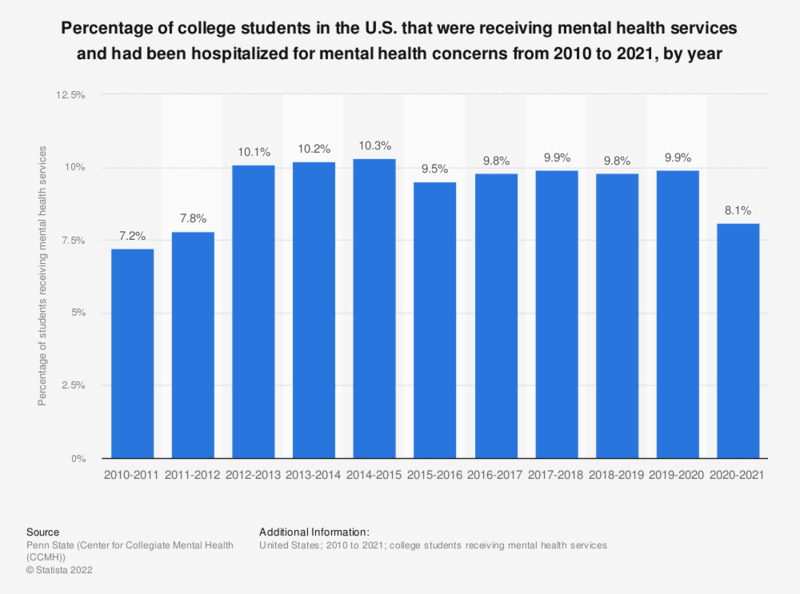 This statistic shows the percentage of college and university students in the U.S. who received mental health services and were hospitalized for mental health concerns from 2010 to 2018. From 2017 to 2018, around 9.9 percent of college and university students who received mental health services had been hospitalized for their mental health concerns. Number of institutions and clients for each year: 2010-2011- 97 institutions/82,611 clients, 2011-2012- 120 institutions/97,012 clients, 2012-2013- 132 institutions/95,109 clients, 2013-2014- 140 institutions/101,027 clients, 2014-2015- 139 institutions/100,736 clients, 2015-2016- 139 institutions/150,483 clients, 2016-2017- 147 institutions/161,014 clients, 2017-2018- 152 institutions/179,964 clients.